I was having troubles coming up with an interesting title for these cookies, and then with very good timing, i remembered the movie 'butterfly effect'! 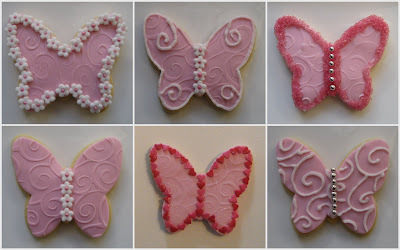 I have a 'butterfly cookie' folder saved on my computer with a bunch of gorgeous designs which i have collected from the net so i decided it was time to christen the butterfly cutter i bought about 2 months ago!! Since these were for the joy of my nieces, i had to do them in pink! I copied a couple of the butterflies (i hope this is allowed!) from a very talented person on flickr, but i still added my own personal touch to them. I used the embossing mat which i purchased at the high tea cupcakes course, and i just love using it! It gives such a lovely finish, especially when dusted with shimmer dust...it really accentuates the swirls.